Happy Wednesday and Happy Thanksgiving Eve!!! 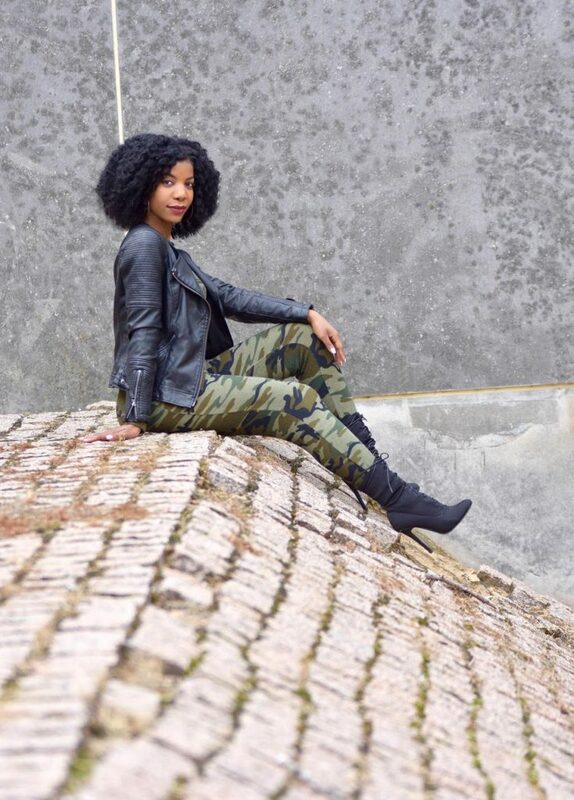 Today on the blog, I’m presenting a look that is a slight switch up for me, and it’s featuring this super cute camo sweatsuit Romwe sent me to review. *Sponsored post but all opinions are my own. May contain affiliate links. If you’ve been following my blog for a little bit, then you know this is the most casual look I’ve ever done. I love Desi Perkins, and I saw her in a similar camo print jumpsuit, so when I saw this one on Romwe.com, I decided to give it a try. When it arrived in the mail, I fell in love. It is super soft, and it looks a little more lux than your average sweatsuit. What I also love about this sweatsuit, is that the top and bottoms can be worn separately. 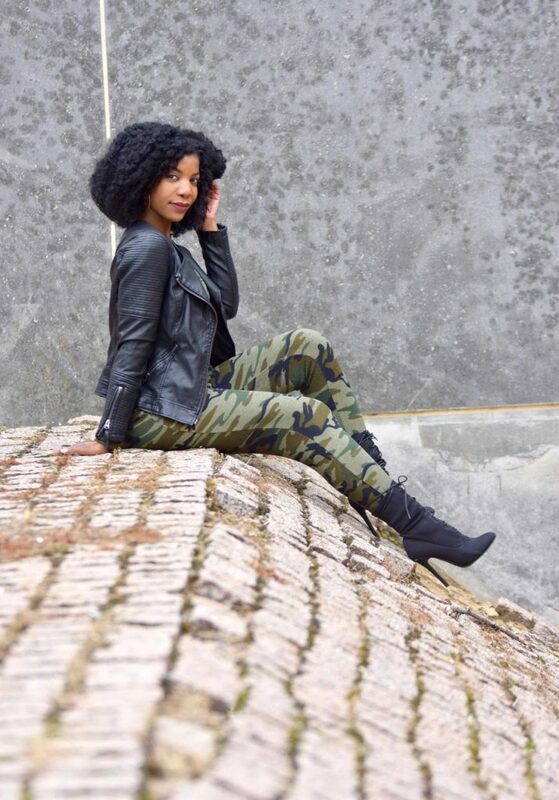 Relaxed camo looks are super on trend right now, and I have so many other outfit ideas in mind involving these pants! This sweatsuit fits true to size, but it’s slim fitting, so keep that in mind when choosing your size if you decide to order it. I am wearing a size Small. If you’d like it for yourself, you can get it here. Of course I had to dress the jumpsuit up a little bit with my favorite *vegan* leather jacket from Topshop, my Ego shoes black lace up booties, and my fav MK black purse. Thanks for reading! 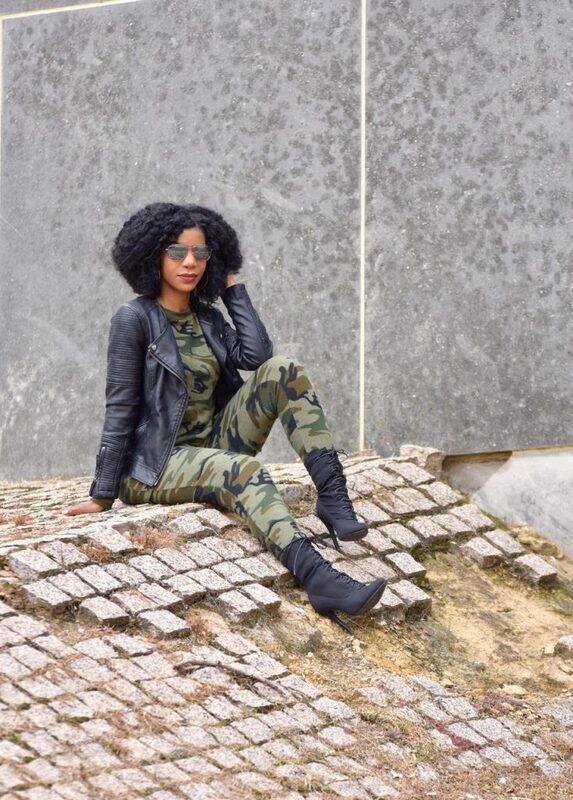 Are you rocking the camo trend this fall/winter? Let me know below! I found me and my husband thrifted camo jackets from Goodwill not too long ago. I like this look. It’s casual and comfy. It’s perfect for Thanksgiving. These boots are super cute! I’m in love with the shaft height. I’m very tall so I don’t feel super confident in over the knee boots, and ankle boots just aren’t cute on me. These are perfect! Yaaaas to all of this! I love the hair and the outfit! You better work it! I just ripped my camo pants (so sad), I love this entire look especially the jacket. I love it and i want it. Wondering if it has any give in the hip area.
? wow! Love love the look, you Have a cool style ??. Can’t wait to see your next look. Everything about this outfit is giving me life! Super cute outfit, but I couldn’t stop staring at your hair. I love it!! So cute! I especially love the boots and the jacket! Yes! I love everything camo. I’ve been obsessed for a few years now. I’m so ordering this. You better rock that camouflage. I love it you dressed up the look really nice and classy! Camo is one of my faves! I have yet to add a jumpsuit to my closet but this one makes me think I definitely need to! Ooh I want this sweat suit. I almost picked up a similar one from another store this past week. Love this look! As always you rock… Thanks for sharing..